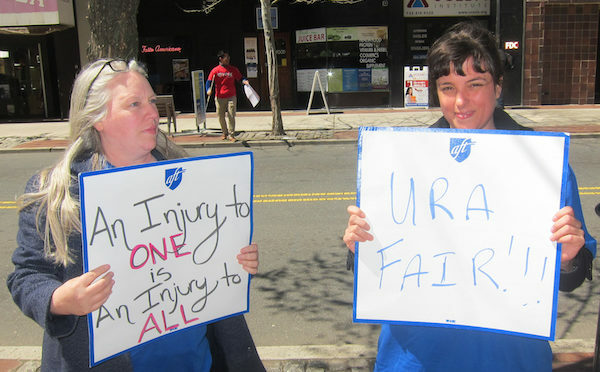 URA and HPAE members rallied on their lunch hours while bargaining went on inside. 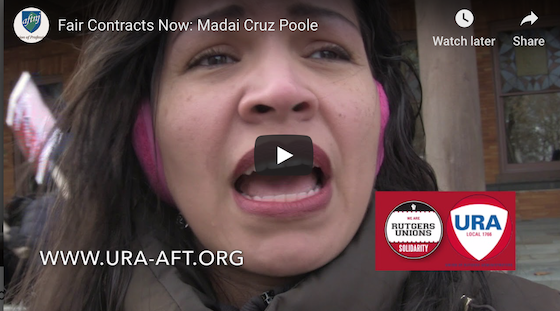 Members called for fair contracts, job protections and health insurance relief. Q: Who is going on strike? A: Right now—no one, but that depends on bargaining. 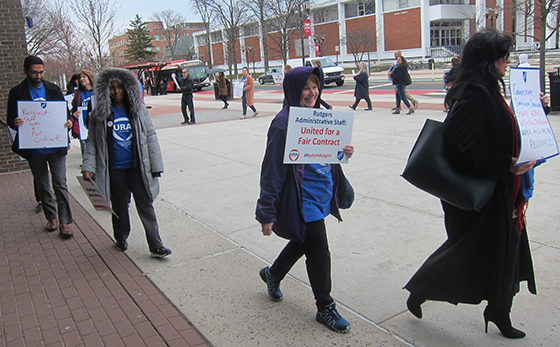 Rutgers AAUP‐AFT faculty, graduate students, postdocs and EOF Counselors authorized the local’s leadership to call a strike if the university refuses to bargain a fair deal. They may call a strike at any time, even on short notice. It will probably depend on progress at their bargaining session scheduled for April 15, 2019 and any others to be scheduled. Q: Does a strike make sense? 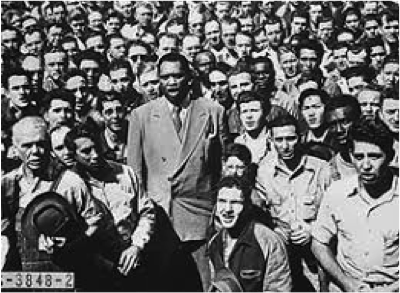 A: A strike is the ultimate expression of workers’ collective power—withholding our labor. 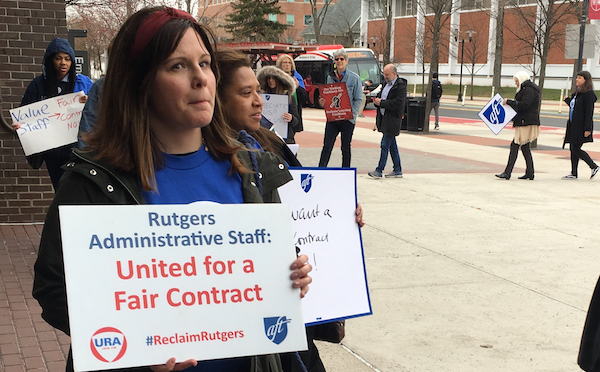 None of us at Rutgers should settle for a less‐than‐fair contract that sets a pattern of poor settlements for other unions who follow. 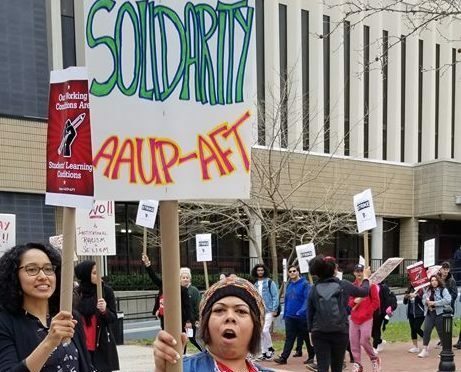 Rutgers AAUP‐AFT members have developed a very carefully‐planned strike effort and are prepared to use it forcefully at any time to leverage the best possible settlement and to stand in solidarity with other unions who need fair contracts too. 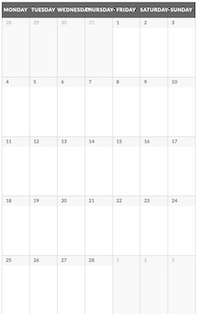 Q: Is anyone else on strike? 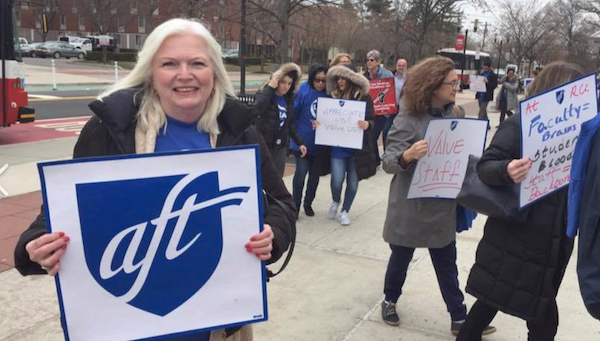 A: No other union at Rutgers has authorized a strike yet. Q: Can we go on strike? A: We are permitted to call a strike authorization vote too according to the provisions of our own constitution if/when necessary. Again, it depends upon progress at the bargaining table and unresolved unfair labor practices committed by the employer. 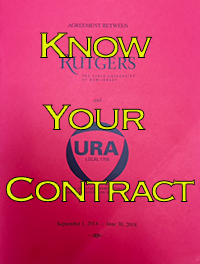 We already filed three unfair labor practices against Rutgers management. Q: How can we support the strikers? A: Refer to Rutgers AAUP-AFT’s website for more details about the strike and how to support it: http://equitysecuritydignity.org/strike-faq/. There are many priorities that we are focusing on: negotiating a fair contract; resolving member and workplace issues; and managing the day‐to‐day operations of the Union. All of these efforts present new and exciting challenges, and I look forward to working with all of you in finding creative ways to build a stronger and increasingly active URA. 1 executive board training held at Labor Education Center to plan for our goals moving forward. Our goal is that management recognizes our exemplary work and the ways that we contribute to make Rutgers work efficiently and effectively on a daily basis. Our work touches every facet of this University, from Athletics to the Zimmerli Museum, every academic department, every business unit, and beyond. We serve the students, the faculty, and the community‐at‐large. We are the stakeholders who are often overlooked and undervalued and we need to change that paradigm. Management can recognize our value through a strong contract. We have not been impressed with how management has responded in this current round of negotiating. We have been bargaining since last April, and they continue to offer low raises and other proposals that negatively impact us and reinforce their low value of the work that we do daily. This means that we need to step up our efforts to be seen and heard. We all want and need substantial raises, affordable healthcare, increased job security, and other parts of a great contract. To achieve that, we need everyone to come out to events. Please consider this a personal invitation. Please also e‐mail us at union@ura-aft.org with any ideas you may have about member mobilization and increased visibility. Together, we can impact contract negotiations and give strength to our dedicated bargaining team. Thank you in advance for your help and participation, and any ideas that you may have.